These motors are designed for many of the varied applications found on the farm. Designs available include motors suitable for aeration fans, auger drives, grain stirring, metering pumps, instant reversing, irrigation tower drives, and crop driers. General purpose motors are also available in both single and three phase, TEFC and ODP construction. For those loads that are hard to start and require extra torque, Baldor is the only motor manufacturer that stocks Repulsion-Start Induction Run motors, in sizes from 2 HP to 10 HP. Super-E Motors are designed to conserve energy over extended time periods. These premium efficiency designs are available in both Totally Enclosed Fan Cooled and Open Drip Proof construction. All three phase motors are Inverter Ready per NEMA Standard MG1, Part 31.4.4.2. This means the motors in 230 and 460 volts meet NEMA'a corona inception voltage requirements, under this Standard, and can withstand peak voltages of up to 1600 volts. Motors having premium efficiency are also available in single phase designs. These single phase motors are available in both totally enclosed fan cooled and open drip proof construction. Built as industrial quality with 200 degree C., moisture resistant wire, the motors have UL and CSA recognized component approvals. Nema frames sizes include 56 through 184 in rigid base only or NEMA C face with base. Baldor's Washdown Duty Motors are available from stock in single and three phase AC and in DC designs. Horse powers range from 1/2 to 20 HP. Designs include motors having an electostatically applied epoxy finish, paint free having major components of the motor in 300 stainless steel, and all stainless steel. Applications include food processing, packaging, pharmaceuticals, or applications where motors are regularly exposed to high pressure wash down. These NEMA frame DC motors include permanent magnet designs through 5 HP and would field designs through 500 HP designed for adjustable speed operation from SCR controls. Applications include conveyors, extruders, winders, printing presses and metering pumps. Most designs are constructed so a tachometer may be added for closed loop applications. Permanent magnet and wound field designs for 90 or 180 VDC have a 20:1 constant torque speed range. Baldor has designed a Permanent Magnet DC Motor with an integral 50 VDC per 1000 RPM precision tachometer. Its compact design fits into many locations where a conventional motor wont fit. Plus it is less costly than buying the motor, tach kit and tachometer. Applications include precision metering pumps and tensioning. The N-Series brushless servo motors provide a very responsive acceleration in a rugged, durable design with high energy Neodymium Iron Boron magnetics. This series provides continuous stall torque capability ranging from 3.9 lb-in (o.45 N-m) to 354 lb-in (40 N-m). Peak torque capability is nominally 4 time continuous. This series has the lowest inertia to provide the maximum torque per package size. This is the best overall performer for general applications. The A-Series of brushless servo motors provide a very responsive acceleration in a durable design using Samarium Cobalt magnetics. This series provides continuous stall torque capability ranging from 6.8 lb-in (0.77 N-m) to 366 lb-in (41.3 N-m). Peak torques are typically 4 times continuous. Inertia is identical to the N-Series. For applications pushing performance and temperature envelopes, this series performs at its best. The B-Series of servo motors provide "normal" brushless acceleration response with a time proven, reliable ferrite magnetic design, which has long been used in Baldor brushless servos. This series provides continuous stall torque ranging 14 lb-in (1.6 N-m) to 177 lb-in (20 N-m). Peak torques are 3 times continuous. Inertia typically ranges 4-10 times higher in order to provide inertia matching for heavier loads. The B-Series provides an economical package best used in applications with higher load inertias. The Washdown brushless motors are designed for material handling, packaging, and other applications where motors are exposed to washdown conditions. The WBSM Series include features such as: Stainless Steel Shaft Extensions, Stainless Steel Hardware, Double Sealed Bearings, Seals and O-Rings, Welded Sealed Stator Stack, and Premium Moisture Resistant Wire to name a few. Washdown brushless servo motors by Baldor are designed to provide you with the best value, plus durability and reliability in your application. Baldor's DC Servo motors were designed rugged to meet demanding requirements of industrial motion control. Available in diameters from 2.2 - 4 inch (55.8 - 101.6 mm) to provide continuous stall torques up to 56 lb-in (6.3 N-m). They are designed to handle a continuous high temperature of 155oC for reliability and dependability. A wide variety of options are available for customization to meet your application needs - tachometers, encoders, brakes, mountings, shafts, windings, speeds, connectors, environmental. Standards available from stock. With the recent aquisition of NORMAG (Northern Magnetics, Inc.) Baldor now offers a full line of linear steppers, DC linear motors, linear stages, AC linear motors and torquers. 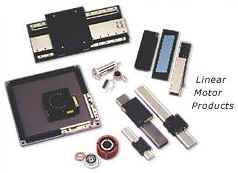 Providing high speed and acceleration combined with precision position control, our linear motors provide solutions for applications such as "pick and place," PCB assembly or inspection, positioning tables, robotics and many more.